Zucchini Corn Saute'A good meatless side dish. In a nonstick skillet, saute zucchini and onion in oil for 4-5 minutes. Stir in corn, and saute 2 minutes longer or until vegetables are tender. 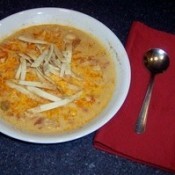 Sour Cream Chicken Tortilla SoupServe this soup with cheddar cheese and tortilla strips as a garnish on top. Yummy! Quick Fruit PieMelt 1 stick of butter in an oblong pan. In bowl mix ingredients together to make a batter. Pour batter over butter; do not stir. Pour 3 or 4 cups sweetened berries or other fruit over batter and butter; still not stirring. Bake in 350 degrees F oven until brown. Delicious Bean SoupSoak beans and simmer. Mash half tender beans. Simmer ham for 1 hour in water just to cover. Remove meat from bone (should have 1-2 cups). Cover carrots and celery with 2 cups boiling water; add onion. Cook until crisp tender. Applesauce-Raspberry SaladDissolve gelatin in 1 cup boiling water. 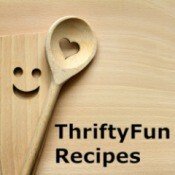 Add frozen raspberries; stir until thawed. Stir in applesauce. Pour into 10x6 inch baking dish; chill until set. Combine sour cream and marshmallows. 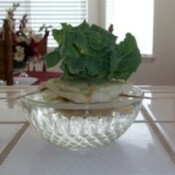 Microwave Mashed PotatoesPlace potatoes in a microwave-safe dish. Cover tightly with lid or plastic wrap. If using plastic wrap, poke a small hole in the wrap. Microwave on high for 8 minutes or until done. Use oven mitts or tongs to remove from microwave. Something Different for CornPlace all ingredients in saucepan. Cook, covered, for 1/2 hours. Milk Chocolate Bourbon BallsIn medium bowl, combine cookie crumbs and bourbon. In heavy saucepan, over low heat, melt chips. Remove from heat; add sweetened condensed milk. Gradually add crumb mixture; mix well. Chicken PacketsMix chicken, cream cheese, green onions (or chives), milk and salt in a medium bowl to make filling. Divide dough into 12 portions and put 1/4 cup of filling on each. Be Wary of Snakes in MulchDo not grab handfuls of mulch. Dump it out on the ground and rake through it. They have found snakes (copper heads) and other critters in the mulch still alive. Reuse a Dog Enclosure for RabbitsI had a cage that was in good condition and had lasted through several small pets. When my rat died of old age, I decided to adopt from the local animal shelter. Here is Ben, he is neutered and he was found in a box in the parking lot. 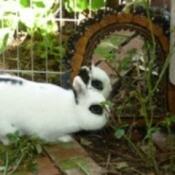 Rabbits love to look in mirrors. Treating Serious Behavioral Issues In ChildrenYou might suspect your child might have a disability, screening for disabilities at the child's school is the first step. Add Whipped Topping to Stretch FrostingWhen using canned frosting mix, place the mix in a bowl and add 1/2 cup of whipped topping with it and whip with mixer for about a minute. It doubles the amount and makes it easier to spread. 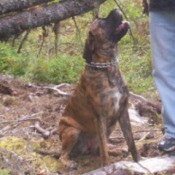 Justice (English Mastiff)Justice is a 2 year and 2 month old pure bred English Mastiff. Recycled Draft BlockersTake two tubes from the inside of wrapping paper. Cut them to about 1/2 inch shorter than the door and stuff them with news paper or junk mail. Put them inside one leg that has been cut from of a pair of nylons. Make sure it fits properly before tying the end off. Keep Insects Off Your Fruit TreesHere's a tip to keep insects out of your fruit trees: Take a gallon milk or water jug and fill it half full of water. Place a banana skin and l cup of sugar inside and mix. Baking Soda for Stained CountersGet out the baking soda if you want to clean a stain on that darn counter top. It works 100x better than any cleanser on the market. The great thing, it's all natural and you don't have to worry about chemicals getting spread around your home. Links: Frugal Wedding Reception SuppliesI just have to share my good luck at finding the right websites for a budget wedding reception! I am in charge of doing the reception for my budget minded friend, and I have only $200.00 and need to decorate 8 tables, plus 3 tables for cake, wed party, gifts, food, etc. Cake for the BirdsMix all ingredients. Bake 1 hour at 350 degrees F. Cool, remove and put in mesh bag. Hang from tree branch. Garden: Kitchen CabbageAfter seeing the "celery plant" tip, from the bottom of a fresh celery, I decided to see if the bottom from a Napa Cabbage would work. It did, and sprouted literally overnight. Picking Colors When DecoratingWhen you are decorating a room, paint it white or cream then pick one of your favourite dark colours. Use this color for the curtains, light shade, bedding and throw. Add a light colour that you like for the accessories. Minnesota State Fair "Veggie" BurgerThis exhibit was so cool, vegetables used to make something other that what it was. This was at the Minnesota State fair. 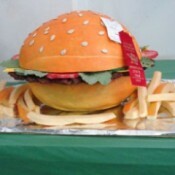 This looks like a close up of a burger and fries, Makes me hungry! 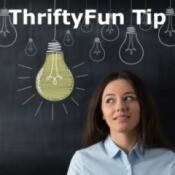 Use Lighter Fluid to Remove LabelsThe easiest way to remove price and other stickers, even from book covers and jackets, is lighter fluid. Just soak the label and let it sit a minute and most labels will lift right off. Because lighter fluid is very volatile, it dries quickly and doesn't leave a trace. Layer a Cropped Turtleneck Under BlousesMany times I find that I need something to fill in the neckline of a blouse or sweater, but don't want the bulk of a turtleneck shirt under it. Dickies sometimes do the trick, but I have found a better solution. 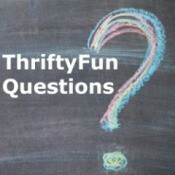 What Is Arbor Day?Arbor Day was started by J. Sterling Morton in the State of Nebraska as a way to stop soil erosion. That first Arbor Day, over 1 million trees were planted. 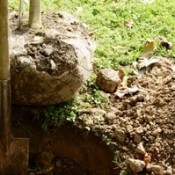 Now Arbor Day is celebrated in all fifty states but in different months so that they hit the best days to plant trees. 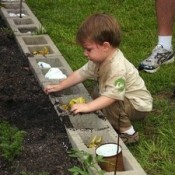 Family: Grandson Playing in the GardenPicture of my grandson playing in my garden, he loves to play in dirt. Romantic Bedroom DecorationsI need help with romantic ideas for decorating the bedroom. Using Old NewspapersI would like to know what to do with old newspapers besides recycling. Thanks! Plug-in Fragrance Stained FurnitureA Bath and Body plug-in fragrance spilled on the furniture. It looks like it took all the color out. Is there anything I can do to restore it? Birthday Party for Two ChildrenI'm having a party for my two boys who will be turning 5 and 10 next month. I need some ideas in how to combine their parties. I need advice on themes, games, etc. Would it be crazy to have two different themes? The older one wants a color theme while the younger is still into Diego. Pie Filling Using Dried CherriesDoes anyone have a recipe for making cherry pie filling using dried cherries? Starting Puppy on B.A.R.F. DietI am getting an 8 week old pitbull and was wondering when it is that I can start him on the B.A.R.F. diet? Mold on Wood Window SillsHow do you remove mold from wood window sills? Crocheted Bunny PatternI am requesting help finding a knit or crocheted bunny rabbit pattern. Any help would be greatly appreciated! Permanent Marker on Paneled WallsHow to get permanent marker off paneled walls? Instructions for Apple Pie Knitting LoomSomeone gave me an old Apple Pie Knitting Loom. Does anybody know where I can find instructions for using it? Thanks. Decorating a Tip JarI am in charge of our tip jar at a pizza shop. For March we are doing a big promotion for March Madness Basketball. I need an idea for some kind of basketball themed cannister or something like that. Chemical Odor After Plumbing WorkI recently had major plumbing work performed in my master bathroom. They had to remove the tiles in my shower to get to the pipes. Upon completion of the work including re-tilng of the shower, there seems to be a lingering strong chemical smell.